Prepare for a jaw-dropping performance as SNSD performs GEE and I Got A Boy for Music Bank’s 700th episode! I, for one, am missing their hot stages. You gotta love that cameraman! Ha! Following their performance on Music Bank, Taetiseo is back on Music Core. I have to say, Taeyeon looks so cute with yellow. It brings out the dorky in her..somehow… Anyways, check out their stage below! On the 25th, Taetiseo won Triple Crown on Music Bank! This is the third one after winning on MBC’s Show Champion and Mnet’s M!Countdown. Taeitiseo said, “Twinkle~~ 1st place for 3 weeks!!! Thank you so so much~! TaeTiSeo decided to keep one trophy each~♥“. Check out their group photo posing with the trophy! In case you missed the performance, here it is! 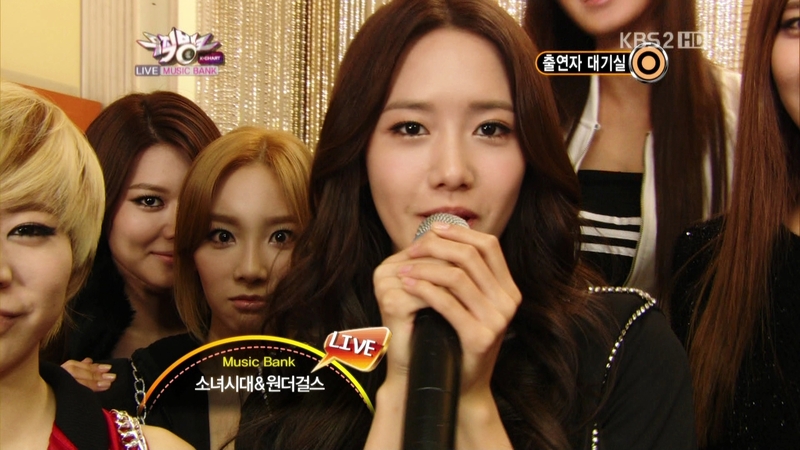 On December 16th, SNSD returned to Music Bank with an explosive performance of “MR.TAXI”. In contrast to the police uniforms worn on yesterday’s M! Countdown, SNSD donned grey outfits that, despite the usual blandness of the colour, contained a tinge of velvet and a lot of sparkle. Of course, we can’t forget about those knee-high black boots. SNSD promoted and saw huge success with “MR.TAXI” in Japan earlier this year, and it seems the Korean version of the song has proven to be equally as popular in Korea. The girls will continue to promote the song until the end of the year. 6th K-Chart Win for SNSD! Five Music Bank Wins in a Row! Even though we saw SNSD wrap up promotions last week, they still managed to take home a fourth win on Music Bank against Wonder Girls, meaning that they would return to the show the following week. Meeting again for the second time on November 25, the two K-pop powerhouses went head to head for the number one spot and, with only 123 points separating the groups, SNSD secured their fifth K-chart win in a row for ‘the Boys’! 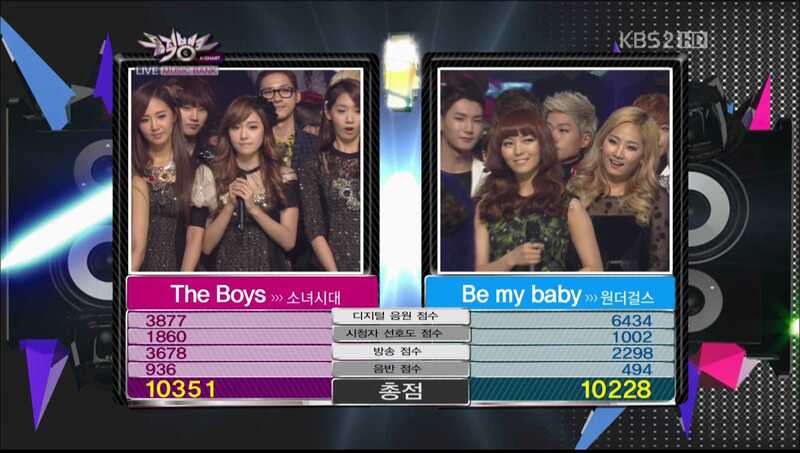 Despite the very small 123-point margin, this win displays SNSD’s unwavering popularity in Korea. (Just a little side, click here to listen to Sunny count the point difference. d:) Overall, SNSD have won the Music Bank K-chart 32 times. Check out their backstage interview, performance and win after the cut! Four Wins in a Row on Music Bank! SNSD took their fourth consecutive win this week. SNSD Takes the Triple Crown on MuBank! SNSD have won the K-chart triple crown, marking their third consecutive #1 on Music Bank for ‘the Boys’! Unfortunately, there was no WOO WOO!! encore the girls were not present to receive their trophy as they are currently on their way to the land down under for tomorrow’s K-pop Music Festival in Sydney.